Mornings start by the fire or looking out a window… contemplating this amazing world. Reading God’s words. Pausing to pray for one person but getting side-tracked with another person and their mother, their sister, their son and daughter, a little music and it’s 9:30 before I know it. How did that happen? I love ironing; watching the wrinkles smooth out from the fabric, laying out the sleeve, starching the cuff. No one irons clothes anymore. My life is a slow-motion dance across the stage of the day. Careful, thoughtful, sincerely engaged. I am terribly afraid that I am woefully out of step with my world swirling around me. How will I ever pour enough out there to keep up? Faster and faster they all dance, and I am still just slipping on my dancing shoes. I breathe a prayer for guidance from the Holy Spirit and all I get is the silly adage; “The Tortoise Wins the Race.” Okay. I don’t think that is the Holy Spirit guiding me – I think that is my own subconscious mind at work. But as I think for a moment, I do remember times of Jesus moving slowly – at least slower than the people who were walking with him would have wished. Do you know the story of Jarius’ daughter? Jarius was a leader at the synagogue – which means he was a pretty important, prestigious, respected man. We are told he had one daughter. She was twelve. And she was really, really sick – dying, we are told. And Jarius put aside his pride, admitted his lack of power and rushed through the streets to find this new prophet Jesus – because rumor had it that he could heal. He fell at the feet of Jesus and implored, begged him to come to his house, and heal his beloved, precious daughter. Jesus nodded yes. And off they go, the crowd pressing around them, growing larger with each stride – after all, who wouldn’t want to see this Teacher Jesus heal the young girl? Can’t you see them; the urgency as robes flow out behind them, dust kicking up from their sandals, jabbing elbows as the people push closer, moving faster… trying to keep up as they jostle against the stream of people moving in the opposite direction and suddenly the teacher Jesus comes to a complete and total stop. He turns. He looks behind him. His eyes search the crowd. “Who touched me?” he asks gently. And suddenly, the world slows down. It comes to a grinding halt, as Jesus stands – refusing to move forward until his question is answered: until this person, who has touched him comes forward. Peter is the first to speak – of course! He is in a hurry to be on their way because Jesus has something incredibly important to do. “It’s just the crowd pushing against you!” he explains. You can almost see him rolling his eyes with impatience, and tugging Jesus by the arm. No, Jesus stands his ground. “It is much more than that. I felt power leave me when I was touched.” And they wait. How long did it take her to get her nerve up? To humiliate herself in front of this crowd of neighbors and acquaintances and strangers? She had dared not to even touch him… just the fringe of his robe… yet here she is exposed, trembling, and healed. “I touched you,” she tearfully admits as she steps away from the cover of the crowd and towards this healer Jesus. Her eyes are locked with his until she falls at his feet and gives her reason. “I have bled for 12 years.” There is no need to explain. Everyone in that crowd knows exactly what that means. She is unclean. Untouchable. Unacceptable. Unwelcome. Un-whole. She couldn’t go to the synagogue. She couldn’t be touched by her husband, her sisters, her friends, her children. She was unclean and whoever she touched, became unclean. She had hired doctors, nothing. She had made the prescribed sacrifices. Nothing. Her money was gone. Her hope was gone. Her life was gone, and nothing would change until… if… the bleeding stopped. And there he was: Jesus. She saw him moving quickly through the street. And she thought, “If I touch him… maybe.” She held her breath, she reached forward, and she hoped. And Jesus stopped. He stopped, and he searched the faces in the crowd, for her. In front of God and everyone, he declared her faithful, forgiven, clean. He reached down and lifted her to her feet. This is my own addition because we do not know what really happened since the story was suddenly interrupted. Oh, isn’t this exactly like us?! Time has run out. It is too late. Don’t bother. But this is not our God. Time doesn’t run out on God’s timing. God’s timing – whether it is too early or too late in our minds – always brings the glory right back to God. 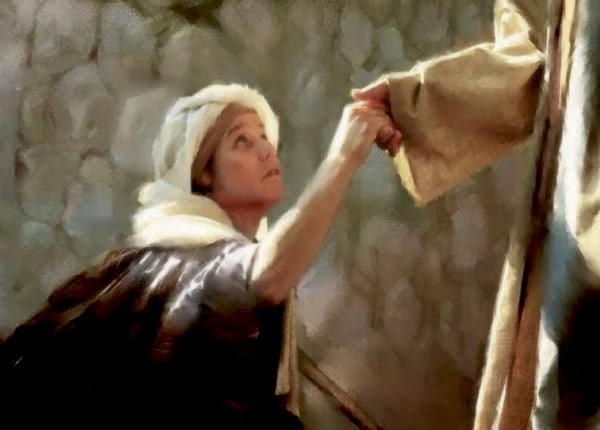 Jesus stopped to seek out a woman who needed to be publically healed. And that allowed him to do something much more wonderful than healing Jarius’ daughter. He got the opportunity to prove he not only could heal the sick, but He also had the power to raise the dead back to life. I think I need not fret if I am not moving as quickly as the world around me. As long as I touch those along my way, and give God the glory, I should be alright. After all, Jesus didn’t seem to be in a big hurry. And who can argue with his perfect timing? Question: Do you struggle to keep up with the world’s schedule? Do you take time to really see the people around you? Living Bible (TLB)The Living Bible copyright © 1971 by Tyndale House Foundation. Used by permission of Tyndale House Publishers Inc., Carol Stream, Illinois 60188. All rights reserved.